Sun Lashes Out At Mother Earth! 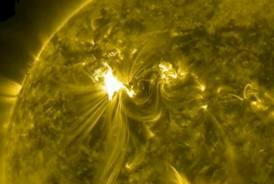 An intense Solar Flare near the center of the sun is threatening to send increased amounts of radiation directly at the earth and may actually disrupt GPS tracking devices and electrical service in the next several days. - Al Gore immediately called for an end to “Solar Warming”! - The only bright spot in this whole story is that the flare is a really bright spot.